Portraits of Us is a devised piece of theater which highlights our strengths, who we are as individuals with all sorts of abilities living in community. The piece is a celebratory, empowering, insightful and educational piece about what it means to live in modern times with different abilities. The piece is made up of nine vignettes each highlighting an important time in each of our friends’ life where they either faced struggles from within or point to challenges along their own karmic paths. Portraits of Us had its public debut on April 13th, 2018 at the Hudson Hall in Hudson, NY and has been performed locally at several venues including the Hawthorne Valley Waldorf School and Camphill Ghent. 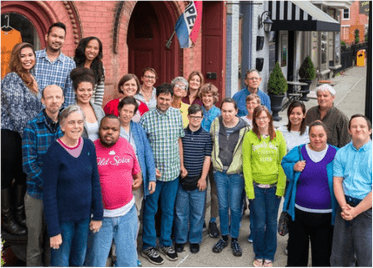 Camphill Hudson is a group of individuals dedicated to creating community with people of all abilities in the City of Hudson. Camphill Hudson works to build healthy social relationships in an environment dedicated to personal and social healing and caring for the earth. In Camphill Hudson we recognize the wholeness at the core of each individual and value every individual’s ability, right and responsibility to make a meaningful contribution to their community. Our goal is to bring Camphill into the world by fostering community building activities with people of all ages, races, abilities, classes and creed.